It's coming up on the holiday season, at least here in Canada. No matter which holidays you celebrate, chances are you have a cookie tradition. Gingersnaps, Scotch Shortbread, Candy Cane cookies. As one of those people who plan things WAY ahead of time, I was already thinking about what to do for Yule this year. This will be our second Yule with Brianna, and our first one where she will sort of know what is going on. Well, she will at least be able to pick up on the excitement. This thought bounced around for a while, and I realized we don't have any holiday cookie recipe we can call our own. One that is ours, not our family's. Not that there is anything wrong with the cookies I grew up with. I just really wanted a cookie I could say was OUR tradition. So I made a very tiny batch of shortbread cookies. A quarter of the recipe. Just to experiment with, mind you. Then I added some Vanilla. And then some spices. These cookies smell amazing, it is a deliciously spicy and smooth scent all at the same time. The taste is just slightly sharp, with a hint of the creamy softness of Vanilla. I'm so in love with these cookies. Just because they are so fabulous, I feel I cannot be selfish. I have to share the recipe. After all, that is what the holiday spirit is all about right? Right. Cream your butter and sugar together. Add vanilla, nutmeg and ginger. Stir. Add the flour one cup at a time until you have a dough that is stiff enough to be rolled out. Gather into a ball. On a lightly floured surface, roll to about a 1/4 inch thick. Cut out as desired. Place on a greased baking sheet. Bake at 350 for 8 to 10 minutes or until golden brown. I personally find that Ginger can be really overpowering, and I didn't want the nutmeg to be shoved out of the way. I only put 1/4 tsp of Ginger in mine. I cannot wait to make these again for Yule! They are far too rich for Brianna to have a lot, but I will let her have a bit! 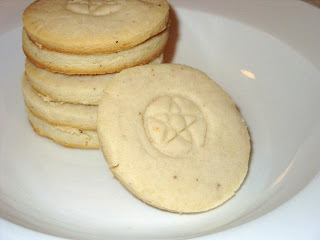 I used my new Pentacle Cookie Stamp that I bought from Dragon Moon Gifts. I'm fairly sure they don't carry it anymore, but it is a great store to check out none the less. You can also find them at the Willow Grove store. It is smaller than I thought it would be, but I think the end product turned out really well with the smaller size. I'm fairly sure that these will become a Yule staple in our home. What are your favorite holiday cookies? Which ones have special memories attached? I love the pentacle on your cookies. Mom always made sugar cookies and I loved them the most because they sparkled with sugar on top. But now my favorite is shortbread with all that yummy butter. Thank you for sharing your recipe!